1. In the veggie patch: Work the coffee grounds into the soil around tomatoes and corn, or sprinkle them on the soil around lettuce, beets, broccoli, beans, and peas to deter rabbits and squirrels. 2. On Seedlings: Putting used coffee grounds into the water that you use on little seedlings can give them a nice nitrogen boost and help them along. 3. 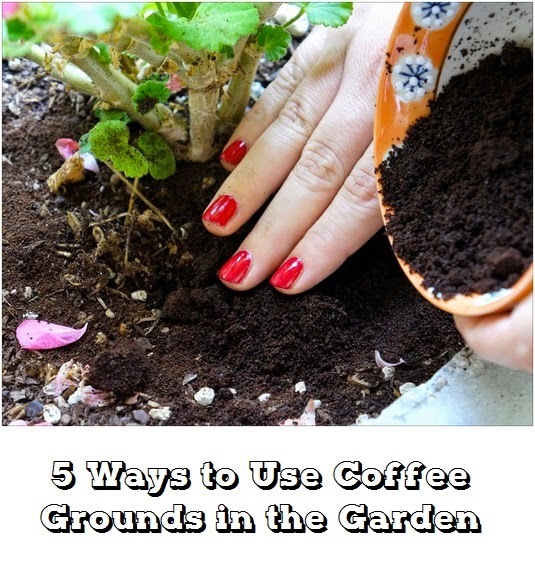 Clean up: When it’s time to come in from the garden, scrub your hands with used coffee grounds for a great deep clean, exfoliation, and to remove smells like onion and garlic. 4. On Pests: A mound of coffee grounds a couple of inches high around an afflicted plant can be a natural way to deter slugs and ants! 5. On Flowering Shrubs: Sprinkle old coffee grounds on the ground around roses, azaleas, and hydrangeas to keep them extra happy. Make sure to keep the overall depth of grounds to less than 1/2 inch in any one spot to avoid mold and mildew.